Target Tag is a 4-player minigame in Mario Party 7. Its name is a pun on the real-life game "target tag", in which players are tagged by being hit by a ball or suction cup dart. The four players jump into their respective cannons and are launched airborne. The players use the control stick to maneuver themselves into the targets. Players get the number of points displayed on the targets they hit. They must be careful however, as hitting targets with a Bowser symbol on them will deduct all their points. The bigger the point value, the smaller the targets, and those with Bowser symbols are the largest. The player(s) who has the most points at the end of the game win(s). This is one of the minigames that can appear in Decathlon Castle. Here, the player's objective is to get as high of a score as possible to earn as much points as possible, up to a maximum of 1,000. The winner(s) do(es) their winning animation. Rules – "Fly into the floating targets to earn points. The player with the most points is the winner!" Advice – "Hitting a Bowser target will take away all your points. Be careful!" 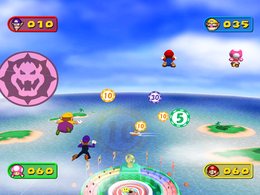 Surf's Way Up, a minigame featured in Mario Party 8, is very similar to Target Tag. This page was last edited on March 27, 2019, at 01:15.